Like his uncle, Ed summons considerable emotional complexity from within his characteristic bombast. His slide can make his guitar scream like an outraged panther, moan like a hell-bound soul in torment and act the fool like a trickster, often over the course of a single song. Although not usually known for his single-string lead work, here he shows himself more than competent in that style, combining post-B.B. string-bending with a raw, focused intensity. On two tracks here, I’m Done and the brooding social commentary Troubled World, erstwhile rhythm guitarist Michael Garrett steps forward to unfurl a fiercely dexterous lead style of his own; bassist James “Pookie” Young lays down his trademark deep-pocket groove, drummer Kelly Littleton pushes everything along with relentless abandon, and special guest pianist Sumito “Ariyo” Ariyoshi contributes his usual barrelhouse-flavored drive to the proceedings. 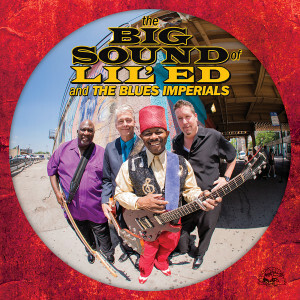 So, yes, Lil’ Ed is a true blues roots man, and both traditionalists and contemporary-minded blues lovers with big ears should savor what’s here. 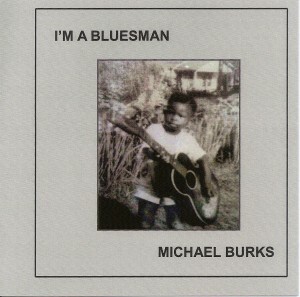 Guitar slinger extraordinaire Michel Burks was born in Milwaukee in 1957, moved to Camden in south-central Arkansas in 1970, released his first self-produced CD in 1997 and, after recording four highly acclaimed CDs for Alligator, died much too young in 2012. Now, thanks to the efforts of his widow, Bobbie Burks, and his childhood friend Wightman Harris, we can add another disc to the Burks discography. Recorded the year after the release of his debut disc, the dozen titles here were reportedly intended for release on Malaco/Waldoxy under the aegis of co-producer and drummer Paul Lee, but they remained in the can following Lee’s untimely death. The sessions took place at bassist Bob Greenlee’s King Snake studio in Sanford, Florida, with Burks’ bandsmen Vernon Allgood and Lance Womack splitting rhythm duties with Greenlee and Lee, Doug Bare on keyboards and King Snake regulars Ace Moreland and Warren King helping out on rhythm guitar. Eerily, not only Burks and Lee, but also Greenlee, Moreland and King have since passed away. Their music, however, lives on, and it’s hard to see why this material remained in the can for so long—it’s top-quality stuff from beginning to end, with songs from Joe Louis Walker, Lou Pride and Hall & Oates joining a handful of Burks and Greenlee originals. As on its predecessor, there’s a stronger Albert King influence in both Burks’ singing and playing than on his high-energy Alligators that were to follow, but that’s not to say that the music here isn’t intense—it is, and it stands up well alongside Burks’ other discs. 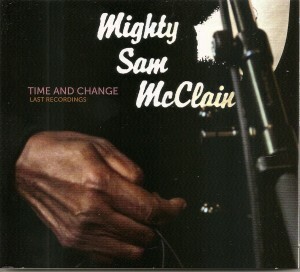 Mighty Sam McClain died on June 15, 2015, not long after this project was completed, so what might otherwise have been yet another proclamation of victory from the legendary soul vocalist will now have to serve as a valedictory. McClain’s voice, although somewhat less resonant than it was in his prime, remains infused with warmth and shot through with passion—any diminution in raw power is more than compensated for by McClain’s ability to deliver his message with unforced conversational intimacy, especially on ballads. The arrangements are funky and straight-ahead, but also admirably quirky, spiced with stop-time gaps and rhythmic switchbacks. Lyrically, the set is a characteristic McClain mixture of tenderhearted meditations on life, love (both romantic and spiritual) and survival. McClain can extract new meaning from even the most time-tested themes. Bad Dreams imbues a simple tale of heartbreak with nightmarish intensity, redeemed from bathos by the low-simmering funk that pushes the song forward. Touch Somebody, again propelled by an understated but irresistibly propulsive funk rhythm, melds worldly desire with a call for universal love and unity—a vintage deep soul theme given new urgency by the choked emotionality with which McClain delivers his plea. The spiritual peace McClain invokes on Praise sounds hard-won, and the tune’s tightly wound dance groove recalls Stevie Wonder at his most ecstatically transcendent. Throughout, the musicianship both complements and intensifies the immediacy of McClain’s message. Co-producer/guitarist Pat Herlehy combines linear thrust with deft rhythmic and melodic mutli-directionality, bringing both good humor and improvisational boldness to his leads; baritone saxophonist Scott Shetler boots Let’s Talk with a combination of street parade ebullience and signifying wit; drummer Rick Page’s rhythmic impetus is both relentless and soothing, inviting (rather than bullying or cajoling) us to get up, join the party and dance. Let’s do just that, in honor of the legacy of a departed but never-to-be-forgotten soul man. 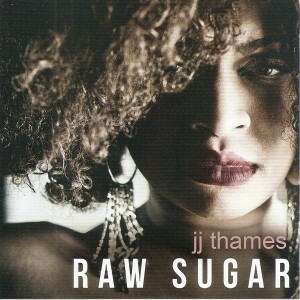 There are few singers performing today who can match JJ Thames in terms of technique, passion and versatility. The Detroit-bred, Jackson, Mississippi–based vocalist delivers 13 tracks in an emotion-gripping mix of gospel, blues, rock ’n’ roll, soul and jazz. On her second album for Grady Champion’s DeChamp label and first to be distributed by Malaco, Thames co-wrote twelve of the tracks (she wrote the other one by herself) with guitar-playing producer Eddie Cotton Jr., applying just the right variations of range, tone, inflection and rhythm to fit each number. She growls and moans one minute, soars the next and often connects her phrases with wondrous melismatic strings as she moves effortlessly between octaves. The album opens with the Oh Lord, a gentle 12-bar gospel blues on which Thames is backed by the acoustic mandolin of Ben Hunter, who’s joined on harmony vocals by Joe Seamons. She rocks out next on Hattie Pearl, the type of tune Ike and Tina Turner once specialized in. Unfortunately, the blues shuffle I’m Leaving, on which Cotton takes two staccato choruses, is rendered at such a fast tempo that she too often clips her words, making many difficult to decipher. She follows with Leftovers, a loping, mid-tempo soul song that’s a little too close to the Young Rascals’ 1967 hit Groovin’ for comfort. The clipped words return on the title track, a slow blues that again features Cotton, on which she brings Janis Joplin to mind. Thames is most stunning when she takes her time on ballads. One that’s especially moving—and certain to be controversial—is the jazz-imbued Plan B (Abortion Blues) about walking out of an abortion clinic after changing her mind before the procedure is performed. 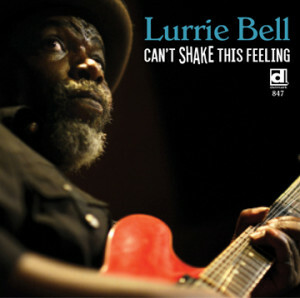 Few blues artists of Lurrie Bell’s generation can work in the postwar Chicago style with such unselfconscious focus, emotional immediacy and creative flair. His debut full-length outing under his own name was 1989’s Everybody Wants to Win (JSP). In 1995, with Mercurial Son, he initiated his still-thriving relationship with Delmark. Since then, both in performance and on record, he has cultivated an international reputation as one of the most gifted and committed carriers of the traditional Chicago postwar blues torch. Longtime admirers know what to expect: musical focus and raw-edged emotionality, conveyed alternately with buoyant effervescence and gut-churning intensity. As usual with Bell, the set list consists of originals and loving recreations of gems originally recorded by friends, mentors and role models both well-known and obscure, including Willie Dixon, Eddie Boyd, Little Milton, Lurrie’s father (Carey Bell) and others (the standard One-Eyed Woman is credited here to the late Maxwell Street Jimmy Davis, who recorded a version of it on a Wolf LP in 1994, but it actually extends a lot farther back than that). Characteristically, Bell brings full commitment to everything he touches; his “covers,” if they can be called that, sound as heartfelt and immediate as his own creations. Bell’s guitar style shows obvious debts to earlier stylists like Otis Rush and T-Bone Walker, but it’s nonetheless highly personalized: he attacks each note with such ferocity that it sometimes sounds as if he’s on the verge of losing control, yet he maintains his equilibrium throughout his extended phrases and creatively layered solos. His voice, as corrugated and weathered as a backstreet alley, embodies both the depth of anguish and the uplifting power of faith that permeate his lyrics and his musical persona (as exemplified in Faith and Music, the autobiographical vignette that closes out this set). At this point in his life, Lurrie Bell can rest comfortably in the knowledge that his is one of the most significant and lasting legacies of the modern blues canon, even as he continues to build on that legacy. 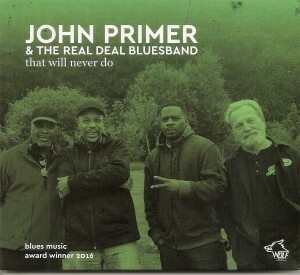 Winner of the 2016 Blues Music Award for Traditional Blues Male Artist, John Primer is a tried-and-true blues veteran who has been performing on the Chicago scene since the early 1960s. His storied career has seen him performing in the house bands at Theresa’s Lounge and the Checkerboard Lounge and serving as a guitarist alongside Willie Dixon, Muddy Waters and in Magic Slim’s Teardrops—a post he held for well over a decade. Despite the supporting role he’s played with so many giants of the genre, Primer is just as well known for his solo work. For his ninth release on the European Wolf label—a partnership that dates back to 1991—Primer once again delivers precisely what one would expect from a leading purveyor of the postwar Chicago sound. This is the tough stuff—straightforward Chicago blues as it was meant to be played by a four-piece combo comprised of harp player Bill Lupkin, bassist Melvin Smith and drummer Lenny Media, with Primer in the lead. All of the baker’s dozen tracks here are covers, but in Primer’s masterful telling none sound derivative. His takes on even the more familiar songs—Mannish Boy, Confessin’ the Blues, Forty Days and Forty Nights—are candid and soulful. A number of the tracks were recorded live, and several offer up that familiar thump-duh-thump groove he perfected working with the late Magic Slim. Primer puts on a virtual clinic with Take the Bitter With the Sweet, a low-and-slow blues as powerful as anything recorded by the marquee names who mentored him earlier in his career. It is true that there are many artists still performing this style of blues, but with more than 50 years of playing professionally in and around Chicago, few can do it with the authority of Primer and the musicians he works with. Barrelhouse Chuck Goering received an unparalleled education in blues piano, learning directly from Little Brother Montgomery, Sunnyland Slim, Pinetop Perkins and others—the masters on the Chicago scene—and has enjoyed a rich, world-roaming career that, while it has never quite paid all the bills, has provided him with greatly satisfying musical opportunities and adventures. I am hard pressed to name another musician from outside the culture who has done as much to help the many musicians he knew and loved and learned from. He has perpetuated their memories through his incredible and loving stories, his adept imitation of their voices and of course by mastering their varied musical styles. Remembering the Masters is an intimate set with the accompaniment of only guitarist/mandolinist Billy Flynn on half the tracks. The rest feature simply Chuck’s vocals and piano, with pianists Lluis Coloma and Scott Grube guesting on one number each. As expected, Barrelhouse Chuck’s playing and enthusiasm are of the highest caliber as he plays some chestnuts in tribute to old friends, and liberally includes a few originals, plus rarely played pieces by Johnny Jones, J.B. Lenoir and a lovely Leroy Carr version of Irving Berlin’s How About Me (sung by Chuck but tenderly played by Chicagoan Scott Grube). Lluis Coloma, an excellent musician from Spain, was entrusted by Chuck to play Little Brother Montgomery’s iconic Vicksburg Blues. Following a spirited Homage to Pinetop Perkins, salted with plenty of Perkins nuggets, and an urgently delivered How Much More (with Chuck approximating J.B. Lenoir’s original high-register vocals) is a superb piano and mandolin version of Johnny Young’s Keep on Drinking, with Chuck taking the Otis Spann role to Flynn’s mando picking. Blues duets between piano and mandolin are simply not heard these days. Flynn then substitutes a mandolin for Scrapper Blackwell’s guitar on How Long Blues by the great Leroy Carr, one of Chuck’s favorite piano men, and, dueting, they play off each other for Chuck’s own Chuckabilly Boogie. Montgomery is again invoked on I Just Keep on Drinking, and Leroy Carr yet again on the beautiful Straight Alky Blues, with its marvelously booming descending bass line. The Little Johnny Jones rarity, Chicago Blues, is delivered with fine rolling chords and sensitive vocal inflection, graced by Flynn’s Elmore-reminiscent slide guitar. Chuck’s great friendship with Chicago patriarch Sunnyland Slim is recalled on Chuck’s raucous resurrection of Slim’s anthemic She’s Got a Thing Goin’ On, as well as the tear-inducing Stockyard Blues by Chicago blues poet Floyd Jones, on which Slim originally recorded. 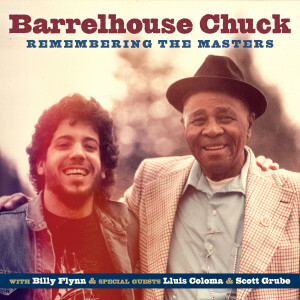 In remembering and celebrating the masters he has known and loved, Barrelhouse Chuck elegantly shows what a formidable talent and masterful musician he himself has become. Anthony “Big A” Sherrod is a native son of Clarksdale, Mississippi, and this young singer-guitarist is proudly carrying on the legacy of the blues legends who emerged from this corner of the Delta. His father, E.J. Johnson, is a gospel singer with the Golden Stars, but Sherrod found his way to the blues through the late guitarist and educator Johnnie Billington and his Delta Blues Education Program. Sherrod, who performs regularly at Red’s Lounge in Clarksdale, has graduated to the big time as evidenced by his debut studio recording Right on Time. The Cornlickers (the late Big Jack Johnson’s band), guitarist Bobby Gentilo, bassist Dale Wise and drummer Tony Ryder provide solid support. There is nothing subtle about “Big A” Sherrod. The blues he makes are no holds barred; his guitar playing is raw and raucous, and his vocals are infused with a deep, gritty soul. On the first track, Rumblin’ Stumblin’, he invokes Muddy Waters’ spirit as he teases the opening notes and then breaks into a slashing, take-no-prisoners boogie. On shuffles like Find Me Another Woman, Right on Time and the instrumental Shuffle in Big A, he proves himself to be a remarkably inventive and fluid player. Sherrod really gets a chance to show off his chops on the slow blues Cold Feeling, as he punctuates his raspy, impassioned vocals with cascades of electric blue lightning, showing that he may be steeped in Clarksdale tradition, but he has definitely spent some time listening to Jimi Hendrix. Two of the program’s highlights illustrate rather different sides to Sherrod’s approach. On Someday, both his vocals and guitar work are stunning in the almost manic intensity he unleashes, recalling early Buddy Guy. With Tried and Tried he heads upriver to Memphis for an absolutely seductive excursion in Stax-style southern soul. It is the type of tune that totally draws an audience in, like a Down Home Blues or Members Only; it is hard not to sing along. At a typical evening at Red’s, Sherrod devotes a good portion of his set to soulful R&B covers, so this may be an added dimension to his art and craft. 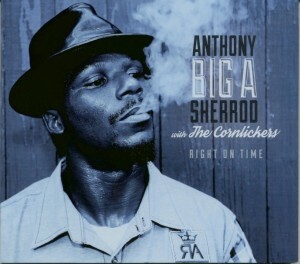 Whatever direction he takes his blues, Anthony “Big A” Sherrod is off to an auspicious start with Right on Time. There is no doubt his Clarksdale blues forbears are smiling down on him! Vaneese Thomas has been making records since she was a kid. She debuted in 1964 doing backgrounds for her older sister Carla on A Boy Named Tom, the B-side of the hit I’ve Got No Time To Lose. As an adult, she’s backed some of the biggest in the business, including Eric Clapton, Celine Dion, Michael Jackson, Sting, Stevie Wonder and, within the past year, Aretha Franklin. As half of a duo called Siren, she scored a minor disco hit titled Open Up For Love in 1979, and on her own, reached No. 10 on Billboard’s Hot Black Singles chart with the mid-tempo soul ballad Let’s Talk It Over from the 1987 Geffen album Vaneese. The Long Journey Home is the fourth album for Thomas and her guitar-playing, co-producing husband Wayne Warnecke’s Segue label in Westchester County, New York. Like 2014’s wonderful Blues For My Father, it again finds her applying her rich, remarkably pliant alto pipes with conviction to a set of blues and blues-oriented tunes. She wrote or co-wrote all but one of the dozen selections. (The non-original is an acoustic rendition of Fleetwood Mac’s The Chain on which she makes some stunning octave leaps.) Drummer Joe Bonadio and bassist Paul Adamy firmly anchor the proceedings most of the time, while the rest of the instrumentalists and harmony vocalists play musical chairs to create unique combinations that serve to ideally frame each number. Kenny Neal’s family is one of the most fruitful and creative in contemporary music. He’s joined by no fewer than eight relatives on this tribute to both the Neal legacy and the symbolic “bloodline” of living heritage and cultural inheritance represented by the blues itself (as exemplified by the opening number, Ain’t Gon’ Let the Blues Die, and its closer, Thank You B.B. King, as well as the atmospheric, spirit-haunted title tune). Neal, born in 1957, is still relatively young by blues standards, but his voice sounds weathered and life-tested; his guitar and harmonica playing also bespeak a care and craftsmanship won through hard-earned maturity, while they’re charged with the ebullience of a soul determined never to grow old. Meanwhile, the horn arrangements both kick things forward and season the songs with greasy funk in the great street-parade tradition. Neal’s lyrics bespeak a contemplative approach toward life and love, even on good-timey numbers like the loping Plain Old Common Sense and the hard-charging, funk-flavored Keep on Moving—he’s never preachy, but he steadfastly avoids the twin postmodernist pitfalls of snark and ironic detachment. (The songs written or co-written by producer Tom Hambridge are likewise thoughtful and mature, even as they reflect the set’s overall mood of forward-thrusting optimism.) The most melancholy outing here is Willie Nelson’s Funny How Time Slips Away, which Neal delivers with the crusty fatalism of a brokenhearted romantic warrior.